Do you ever get a call from a friendly robot who claims to be either “from Google” or “working with Google”? Have you ever had someone guarantee you page one SEO placement because they were a Google Partner? Have you ever had an agency that promises preferential ad placement because of their relationship with Google? These people are the scourge of the agency community, and Google is cracking down—hard. In what can only be described as a robust update to its third-party policies, Google announced a multitude of changes designed to help advertisers avoid unscrupulous “partners” and other third-party services who try to scam you out of your money. It’s long been a cat and mouse game between Google and entities trying to game the system in one way or another. This could be in the form of the algorithm updates designed to improve accuracy in the search experience and reduce the amount of fake news or the introduction and tailoring of the Google Partner Program (formerly Google Advertising Professionals) over the past decade. Claiming that Google endorses SEO Services Google never endorses any SEO company, agency or individual for their SEO skills or services. Google has no plans to offer a SEO Certification. Claiming Ads will Always Appear With the right amount of money and ad quality, it may be possible have a top ad. This has nothing to do with organic search results. Furthermore, Google bases much of ad placement on quality. Even if you pay the most, no one can guarantee with 100% certainty that you will top the list. Selling AdWords Express as Regular AdWords AdWords Express is a limited-feature way to automate your AdWords account. While good for small businesses who don’t have the time to manage their own bidding or the monthly budget to hire a Partner (we require a $1,000 minimum monthly budget), any agency who can’t differentiate between the two isn’t helpful and isn’t helping you unlock the full power of AdWords. Selling or Buying in Bulk Some Partners will claim that the more keywords you select will reduce costs or will buy in bulk. Claiming Google My Business Listings Are Paid Only This is probably one of my favorite autodialer calls. We receive two per phone per day. No. In reality, go to business.google.com, build your profile, get your postcard, and make it official. We offer local SEO services to get your name onto the top local sites, but Google My Business is and will always be free. Claiming to be Google or Working on behalf of Google Wrong. Fake News. There are more false claims Google is cracking down on—misrepresenting a third party, offering location services in unavailable regions and more. Read those on the SEM Post or listen to a larger discussion on Cranberry FM’s SEO 101 Podcast. Additionally, if you feel duped, Google has a complaint center to report violations of third-party policies. Fill out a complaint form here. Penalties range from notifications of noncompliance to Google completely disabling the site from being used for advertising. For more information on the penalties, the SEM Post has spoken with a Google representative and shares some of the consequences that could happen. Has Google Cracked Down on Your Current Agency? If you’re working with one of the entities on which Google has revoked certification, what else have they lied about? Head to the Google Partner search website and check if your current agency is still qualified. If not, it may be time to make a change. In reality, all this means is that Google is asking for honesty from the people who work with them. Getting an honest answer—even from a marketer—shouldn’t be hard. Lack of honesty is just one reason to fire an agency. Learn more in our Marketing Agency Selection Guide. 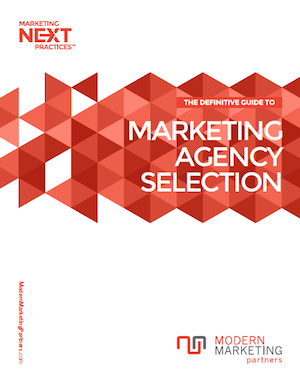 Download our Marketing Agency Selection Guide to learn more. As a Google Partner (search), we are proud that Google is focusing on quality and honesty. This is a welcome change to separate the wheat from the chaff, so to speak. We provide and will continue to provide honest, high quality service to our clients, and would like to help you. Learn more about our paid search services, download our marketing planning and budgeting whitepaper, and contact us for a free website grade and to learn about how we can help you improve your presence through a multitude of means.